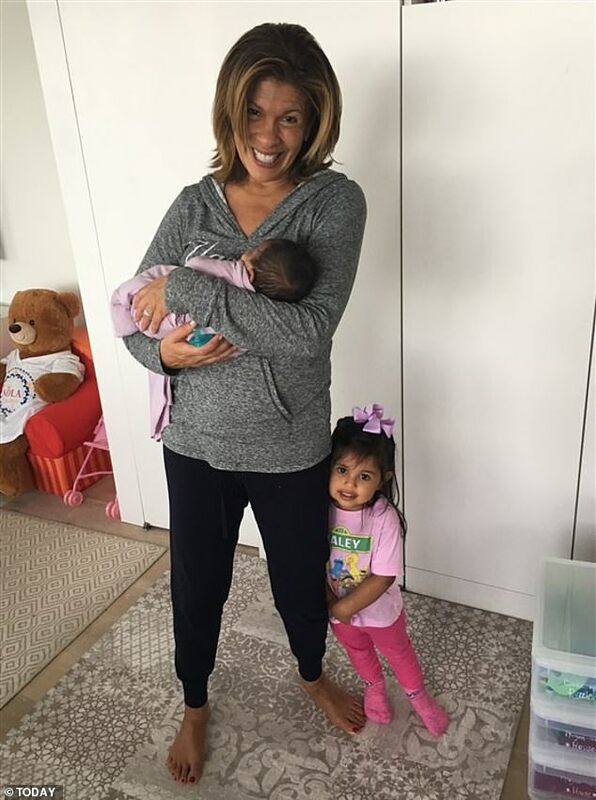 Hoda Kotb has revealed she has adopted a second baby girl at the age of 54, just two years after welcoming her beloved daughter Haley Joy into her life. 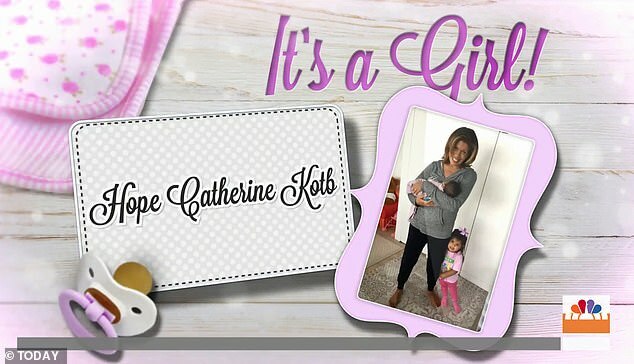 The Today co-anchor surprised her fellow hosts with the news on Tuesday morning, tearfully telling them that she and partner Joel Schiffman have named their new daughter Hope Catherine, who was born this past weekend and welcomed into her new home days later. Hoda’s joyful announcement appears to have come as a complete surprise to almost everyone on the show other than her co-anchor Savannah Guthrie, who interrupted Dylan Dreyer’s Popstart segment with an ‘exclusive story’ – which turned out to be a call from Hoda, who had phoned into the show to share the surprise news. ‘Oh my god you guys, well, first of all she’s laying on the pillow right now, and I’m feeding her, and I can’t believe it!’ a delighted Hoda told her co-hosts, while Savannah and Jenna dabbed their eyes with tissues. ‘In your life you think that maybe you’ve gotten what you deserve, but man I’m so happy she’s here,’ Hoda continued through her tears. The new mother-of-two continued to say that her eldest daughter Haley couldn’t be more excited to have a little sister, revealing that the two-year-old has already happily embraced her role as a big sibling. Mother-of-one Dylan then piped up to ask Hoda if she ‘ever thought her heart could give more than it had already given’, to which the delighted new mother replied: ‘You know what’s funny, you think that you’re full, that’s exactly how I felt with Haley and Joel and everything. ‘And Joel and I were standing there when they hand you the baby, and it’s the closest thing to a live birth I think you’ll ever see but in that moment I was like, my god, my heart just grew ten times, it’s amazing. Hoda then went on to describe the heart-warming moment that Haley Joy met her newborn sister for the very first time, while sharing the emotional meaning behind her baby girl’s name. When it came to choosing Hope’s middle name, Hoda revealed that the decision was made not long before their little girl arrived, sharing that she gave her daughter the name Catherine in honor of her best friend Karen Swensen’s own daughter, as a tribute to the strength she displayed after her father, Karen’s husband, died. Karen, who is a news anchor for WWL-TV in Hoda’s hometown of New Orleans, lost her husband, retired homicide detective John Ronquillo, to cancer in September 2018. ‘We named her middle name Catherine after my best friend Karen’s daughter…’ she explained. ‘[Karen’s] husband passed a little while ago, and Catherine is so super strong, and it just so happens she was here this weekend with Karen, and I was like, there are no accidents in life, everything is supposed to happen in this moment the way it’s happening. It appears that the idea for the sweet tribute may have come when Karen and Catherine were visiting Hoda and her family this past week for a belated celebration in honor of Karen’s 50th birthday. The New Orleans-based anchor shared images of herself and her daughter enjoying cupcakes with Haley and Hoda in their apartment, along with sweet snaps of Catherine reading a book to a delighted Haley. Hoda once again opened up about the sweet tribute while discussing her adorable new arrival on the fourth hour of Today. Having already reduced her colleagues to tears in the first two-hour installment of the show, she phoned in again to speak to co-host Jenna, and Savannah, who is filling in for Hoda while she takes some time off work to look after her newborn. After sharing her shock at the fact that she is now part of a ‘family of four’, Hoda went on to detail the close bond that is already forming between her two daughters. ‘They’re incredible together,’ she said. ‘They are amazing. I was watching Haley with [Hope] and I didn’t know what that was going to mean or how it was going to work. The mother-of-two also admitted that she still can’t believe Hope is real, confessing that she has to keep reminding herself that the little girl is actually a part of her family. Jenna detailed the moment that she and Hoda first discussed the possibility of her becoming a mother for the second time, explaining that she recalls having the conversation not long after Hoda released her children’s book, You Are My Happy, which was written in tribute to Haley. ‘A couple months ago when you had your children’s book out, you put it out into the world, you had told us that you wanted this, that you envisioned this baby in your life,’ Jenna recalled. Hoda admitted that saying those words out loud and sharing that dream with other people was incredibly hard for her however, because she ‘wanted it so badly’. ‘My heart is exploding,’ she said. ‘But I remember, Savannah, I was at an event with you and I remember you said something to all these kids, they were young, budding, could be whatever they wanted to be, and you said, “Say it out loud, even if you whisper, even if you just say it to yourself out loud, but saying it out loud changes everything. ‘And I have to tell you that saying it out loud when it came to Hope was a hard thing to do because I wanted it so badly, I felt like when someone asked me they could see it in my eyes, they knew it!